Actor Sean Bean will be appearing a great deal at your local movie theater this fall. 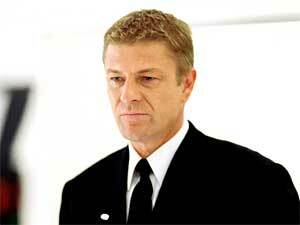 He appears in "Flightplan" with Jodie Foster, which opens this weekend. Then next month, Bean plays a Minnesotan in "North Country." St. Paul, Minn. — British actor Sean Bean trained at the Royal Academy of Dramatic Arts in London, then went on to join the Royal Shakespeare Company. But he is best known to U.S. audiences for his appearances in such movies as "Lord of the Rings," where he played the fallen hero Boromir. He also played the title role in the popular PBS series "Sharpe's Rifles." Bean is up for a busy fall this year, appearing in the psychological thriller "Flightplan," which opens this weekend. He also stars in the Minnesota-based "North Country," scheduled to open in mid-October. In "Flightplan," Bean plays the captain of a brand new passenger plane on its maiden voyage. It's carrying its designer, played by Jodie Foster, and her daughter. When the girl mysteriously disappears after takeoff, the story becomes every parent's nightmare. Then, the crew begins to question whether the child was ever aboard the plane. Bean spoke with MPR's Euan Kerr about both is upcoming movies. Listen to their interview by choosing the audio link in the right column.